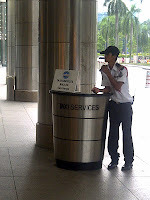 Today i want to let people in Kuala Lumpur know how the taxi service in KLCC operating. If u want to know, that Blue Cab charges was double comparing with the budget taxis. I am sure that all malaysian knows about that, how about foreigner / tourist that just visit Kuala Lumpur just few days ? When they taking that cab without knowing about it, they will feel cheated and for sure they will write that malaysia taxis is scamming & blood thirsty. Its happen to me when I was Q at KL Sentral taxi station. 2 people tourist dont know from which country come to KL Sentral taxi counter and said that they been cheated by taxi driver. The tourist said that from KL Sentral to KLCC they paid RM14 for the coupon and suddenly from KLCC to KL Sentral, they have to pay RM5+ by using meter. They also show the resit and when i look at the resit, its stated Genting Ho Wah Taxi, its the Blue Cab. I explained to the tourist and they frustrated because they are not been told about it. 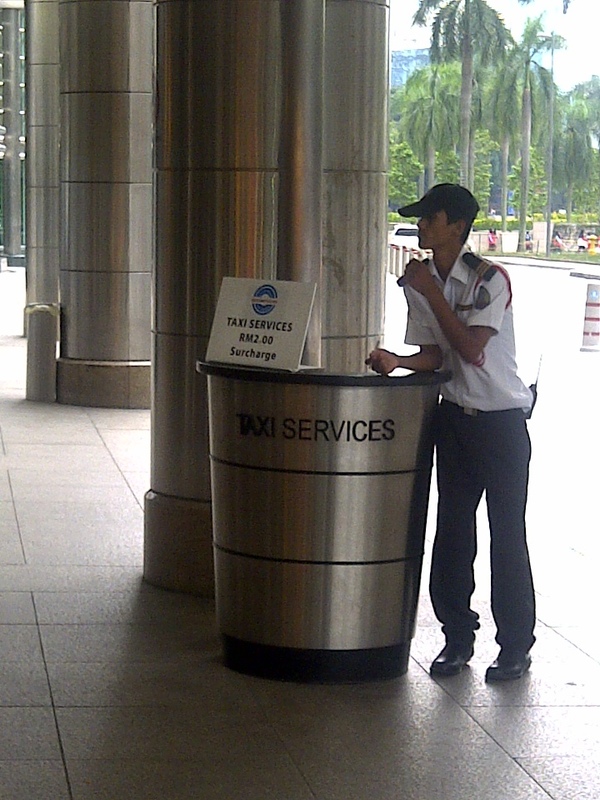 My point is, why KLCC are appoint such a stupid company to run the taxi service at their premise ? Awana Sutera ?? What kind of experience they have ?? I think this is a gangster company because Awana Sutera are hiring gangster to chase away all the budget taxi nearby. Hehe. 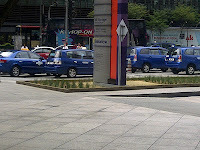 Do u know or not that the Blue Cab there need to pay monthly charges just to get their stand there ? RM300 per month for the Blue Cab. How many blue cab are register with them ?? Why not Awana Sutera implement Taxi Coupon like KL sentral, Time Square, KL Tower and a lot more place are using it. Taxi dont need to pay the monthly charges for the stand and the taxi counter collect 10% from the coupon issued. I am sure they can make a lot and it will solve all the taxi problem at KLCC because every taxi can pickup passenger from there but customer must buy coupon. I know, the main reason KLCC appointed Awana Sutera is to clear up all the taxi scammed outside KLCC, but when they appointed Awana Sutera, the problem not been solve also because passenger that know about blue cab, they will go outside to nego with the budget taxi there / flag which ever taxi pass by there. 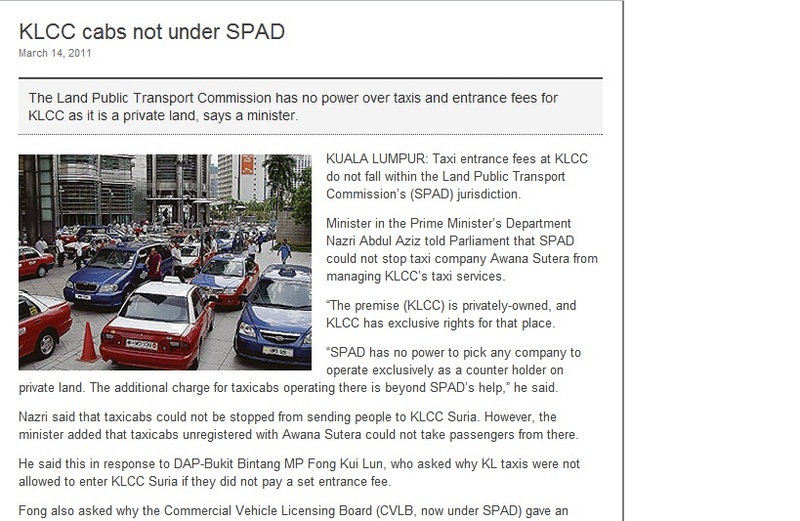 All taxi already demonstrate to show their expression and media also already reported, we also fail a report to the authorities they answer it very simple " KLCC cabs are not under SPAD". U know what they mean about it ?? If Awana Sutera want to charge RM50 surcharge also SPAD cannot take any action on it. So, what is the jurisdiction of SPAD ?? Nazri said that CVLB had met with both parties with taxi passengers in mind. He added that SPAD was also in the process of licensing all “public transport terminals” inclusive of taxi counters. Its been more than 1 year already and nothing has change and happen. Talking more than action. This is what we encounter in Malaysia. Like this post .. i know what you mean. I have been scammed when using the KLCC Taxi. Pay extra Rm2 dunno for what and the cab fare was so expensive. Best of all, the taxi driver was talking on his mobile phone (not using handsfree mind you) while driving the car ... ridiculous. 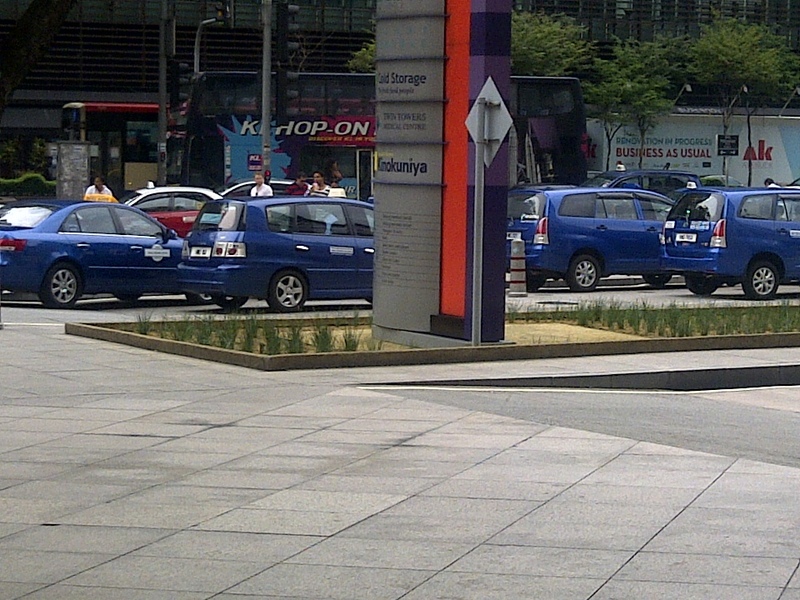 Taxi Stand at KLCC is cheating customers ! The best way i recommend is call a cab from radio taxi company or using taxi apps will be much faster. If u are 5 people and above, its worth it for using that service ... but if u are 4 people and below, paying the blue cab are not worth it.